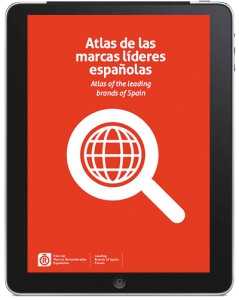 The version for tablets of Atlas of the Leading Brands of Spain in a interactive PDF format. The perfect way to consult from any eBook reader and from all major brands of tablets: Apple’s iPad and iPad mini; Google’s Nexus 7 and Nexus 10; Amazon’s Kindle Fire; and Windows’ Surface and Surface PRO. The interactive PDF version of the Atlas connected, among other features, the business pages of the book with their online pages in the web version. Click the link ‘Download the interactive PDF’. Once loaded, click on the message ‘Open in …’ or ‘Save to …’ that appears on the screen of the tablet. Choose a destination. For example ‘Open in iBooks’ on tablets iPad and iPad mini.